The Punjab Frontier Force was set up and comprised the 1st, 2nd (Hill), 3rd and 4th Regiments of infantry as well as cavalry units. Acting primarily as rapid-response regiments, they would patrol the British borders in search of any Afghan aggression. The Sikhs displayed great bravery during the war and were employed effectively at both Ahmed Khel and Kandahar towards the end of the conflict in 1880. Their courage and dedication was admired by the British and would be utilised to greater effect in future campaigns. A British victory came in 1880, but the war was now more than just an Anglo-Afghan affair, as Russia waded into the conflict. A period known as the `Great Game’ was initiated, and in what has been known since as the `Cold War of the 19th century’, the two powers sidestepped each other without ever locking horns. To stabilise their forces, the British raised two more Sikh regiments, the 35th and the 36th, who would see battle in the next big conflict in the region, the Tirah Campaign. The war was almost inevitable. In the face of further British expansion during the Great Game, the empire became tangled up in issues with various local hill tribes. Although rarely united, they put their forces together against the British in what became known as the Tirah Expedition. As a result, the British lost a fair amount of land in the north west including the strategically important Khyber Pass. With access to the pass now in Afghan hands, the security of the British Raj was in jeopardy. Up to 40,000 soldiers were called into the area including many Sikhs, who were keen to put their skills to the test after being marginalized from the main army in the previous Anglo-Afghan War. After initial assaults by the Gurkha and Highland regiments, the Sikhs were called in to supplement the Highland charge on the bloody but successful Dargai Heights. 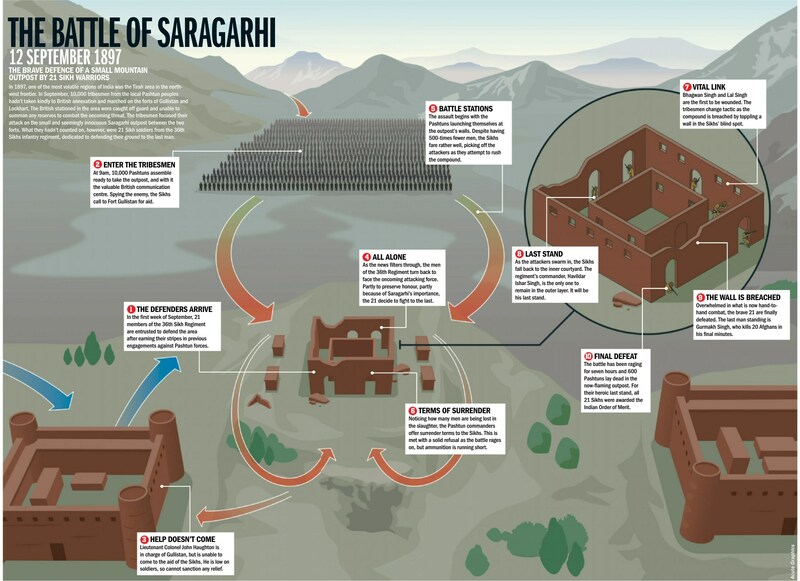 Undoubtedly the greatest Sikh achievement of the war was the Battle of Saragarhi. A backs-to-the-wall conflict of Thermopylae proportions, 21 Sikh soldiers managed to defend a small outpost from 10,000 tribesmen for more than seven hours. Despite receiving no aid from any of the surrounding British forts, the 36th Sikhs Regiment fought courageously and, even in defeat, managed to blunt the Afghan assault for long enough to save the two forts of Gullistan and Lockhart. To this day, Saragarhi Day is celebrated annually in honour of this heroic sacrifice and each of the 21 received the Indian Order of Merit posthumously. The main British Field Force was now in the ascendancy, but guerilla warfare was taking its toll on the beleaguered soldiers. In November 1897, a unit from the Northamptonshire Regiment was going through a village in the Saran Sar Pass when it came under heavy fire. In the end, the group had to be saved and extracted by a combination of Sikhs and Gurkhas, who managed to haul the British out of harm’s away with only 18 men killed. The terrain and local knowledge of the Afghans even made life difficult for the impressive Sikhs, who were ambushed while on the hunt for straggling Afridis, one of the many Afghan tribes. Along with two companies from the Dorset Regiment, the Sikhs were cornered in a number of burned-out houses before making it to safety. 25 men and four officers were killed. The next move of the expedition was to starve the Afghans of their winter food supplies. Accompanying the Yorkshire Light Infantry, the 36th Sikhs made a grave error and, after a misunderstanding, abandoned the strategically valuable heights to the west of a pass. Their position was taken up by a group of Afridis, who inflicted casualties on the men from Yorkshire, forcing them to escape with the aid of a relief column. Perhaps the only battle in history of the world where entire defending force was wiped out and all members awarded highest gallantry award for which they were eligible.